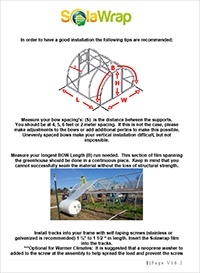 Measure your bow spacings- the distance between the supports. You should be at 4,5,6 feet or 2 meter spacing. If this is not the case please make adjustments to the bows or add additional perlins to make this possible. (Call us we are here to help and give you options). Unevenly spaced bows make your vertical installation difficult, but not impossible. (Again just give us a ring). Measure your longest length run needed. This is how much material will be required for your structure. Please keep in mind that you can not successfully seam the material without loss of structural strength. Rolls are sold either in custom lengths or as master rolls, which are 328 feet in length. **Please note that the first wrap around the rolls is not part of this count, it is given as additional protection during shipping, if your first layer is damaged, not to worry! It is not calculated in your material request. Self tapping screws (stainless or galvanized is recommended) 1 1/4 “ in length 5/16. ***Optional for warmer climates it is suggested that a neoprene washer be added to the screw at assembly to help spread the load, and prevent the screw from heating up and melting through the extrusion. Screw spacing- We have screw placement at 12”-24” spacing between screws. The closer the placement, the strong the connection. Closer spacing is recommended for areas of high wind and heavy rain and snow. 2 work horses and a bar – at a minimum of 1 foot longer than your film size. Clear silicone, outdoor and waterproof (used for the connections between your extrusions. When installing the film, it must go thick side to the sun. If you feel the film there is a distinct difference in the film thickness. Thick side out. The underside is coated with an Anti-condensation coating. Avoid a wavy install, straight is better when installing on your supports. The concave depression in the extrusion will cradle the circular tubing helping with your installation. Need help? Click this button and reach Ken- Mr. SolaWrap directly for help.